Saints are the only club in the Super League era to win the RL Challenge Cup three times in succession - 2006, 2007 and 2008 - but they haven’t graced a final since toppling Hull FC 28-16 at Wembley a decade ago. It is more years than their demanding fans had anticipated, particularly when the so-called big clubs now enter the competition much later than in days gone by and make giant-killing almost a thing of the past. But there is no cast-iron guarantee that Justin Holbrook’s side - flying high in Super League and already 13/8 favourites to lift the Ladbrokes Challenge Cup in August - will clear a testing quarter final hurdle when they take on old rivals and back-to-back winners Hull FC at the Totallv Wicked Stadium on Sunday afternoon in what will be a tension-filled occasion and screened live on BBC2. already beaten the Humbersiders 26-12 on home soil in Super League this season and will have a powerful-looking squad to choose from. (ankle), Josh Griffin (knee) and Jordan Abdull (leg). Albert Kelly is also far from full fitness but don’t rule him entirely out of the reckoning. 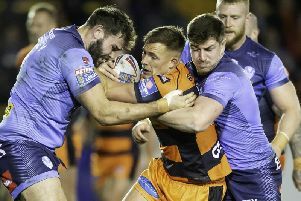 At the same time vice-captain Scott Taylor, currently suffering from an on-going shoulder injury, and Jake Connor, who came off late on in the defeat at Warrington Wolves, will be given until the 11th-hour to prove their fitness. Despite some rather poor attendances generally in the earlier rounds, Saints will be disappointed if they don’t top five-figures - even though the TV cameras will be present. When the two clubs locked horns at the Totally Wicked Stadium on a Friday night in early April they attracted 10,408 fans. The way Saints are playing at the moment and Wembley on the horizon the prospect of a Sunday sizzler - and a crowd to match - look a red-hot certainty.